It is 30 years since the first timbers of the Romano-Celtic trading ship affectionately known as ‘Asterix’ were lifted from St Peter Port harbour. Portsmouth shivered under a wintry sun this morning, with the temperature bobbling around freezing. The timbers from Asterix have been stored in an old chain house in the RN dockyard since 1999, under the care of the Mary Rose Trust. The MRT team have conserved the timbers so they can be displayed in air (more of this anon) and are ready to come back to Guernsey. At 8.30 one of my Guernsey colleagues and a squad of conservators from the MRT began to roll pallets of timbers out of the chain house where they were fork-lifted onto a trio of curtain-sided trailers. 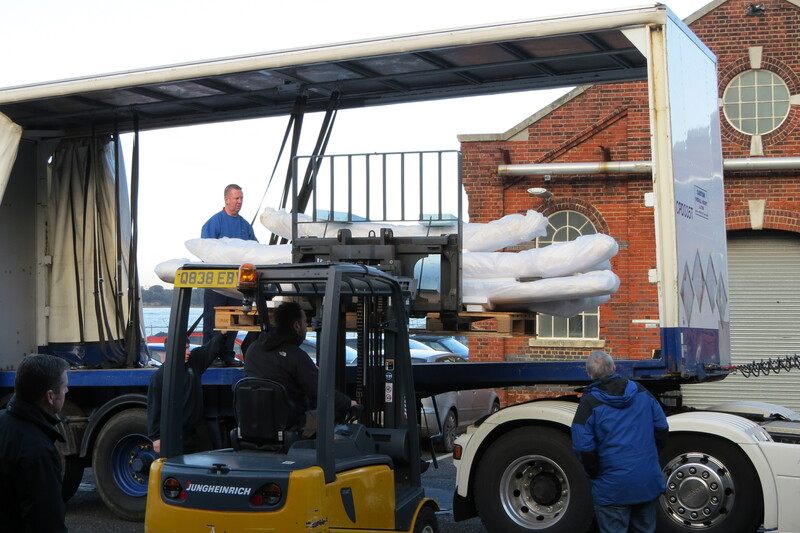 The 22 large floor timbers (frames) were bubble-wrapped on pallets; as they were up to 4.5m long it took some careful juggling by Alex the forklift driver to fit four pallets on an 8m trailer. We had decided not to pile pallets as the timbers are as delicate as balsa wood. The long keel timbers and strakes (outer planking) had been pre-packed into plywood boxes up to 6m long. These could be stacked, albeit very gingerly. A very patient lorry driver strapped all this down to avoid a tossing on the ferry crossing; again his strops could not touch a timber and were padded with Styrofoam. Working on the pig-iron floor of the chain house made it a doubly cold experience, but thankfully there was none of the rain, hail or high winds of last week. After nearly five hours, all 150 timbers were loaded. Cross fingers that ‘Asterix’ crossing to Guernsey is less eventful than its last attempt circa AD280.